By combining composting with recycling, you could divert almost 70 percent of your waste from going into the landfill. Composting is a process that accelerates the natural decaying process of yard and organic waste, such as yard trimmings, leaves and food scraps. Compost is the end result of the decaying process. It is a rich material that can help your plants absorb nutrients and it increases soil aeration and water holding capacity. How Can I Begin Composting? Compost bins can be as simple as chicken wire or a wooden compost bin. You can even cut the bottom out of a plastic trashcan and drill small holes on the sides. Find a level spot in the corner of your yard about three to five-feet square. Pile yard trimmings, leaves and fruit and vegetable food scraps. Keep the pile moist -- not soggy -- by watering it occasionally. Stir with a pitchfork or stick every few weeks to circulate air (without air, the decomposition process slows) and distribute moisture evenly. 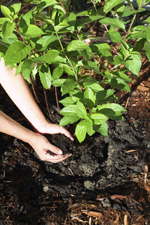 You will know your compost is done when it becomes a dark material that is uniform in texture. It will take several months. Yard trimmings, including weeds, vines, leaves, plant stalks, twigs, and branches. Food waste like fruit scraps, vegetable scraps, coffee grounds, stale bread and egg shells. Other items including straw, feathers, wood ashes, sawdust, plants and most paper in small quantities. Depending on what kind of composter you have, be careful when putting meat, bones, dairy or fat. These could attract pests. Mixing lets the items help each other decompose. So make sure to mix it all up. Don't be surprised by the bugs and heat. That is all a part of the process. Buy some red wiggler worms. They help aerate the pile and make richer compost. Click here for more yard waste recycling tips from the Clemson Cooperative Extension. Download the S.C. Department of Health and Environmental Control's Guide for South Carolina Residents on Backyard Composting. A variety of composters including tumblers, worm composters, and compost bins are available at local home and garden businesses.